Spending way too much on sushi? 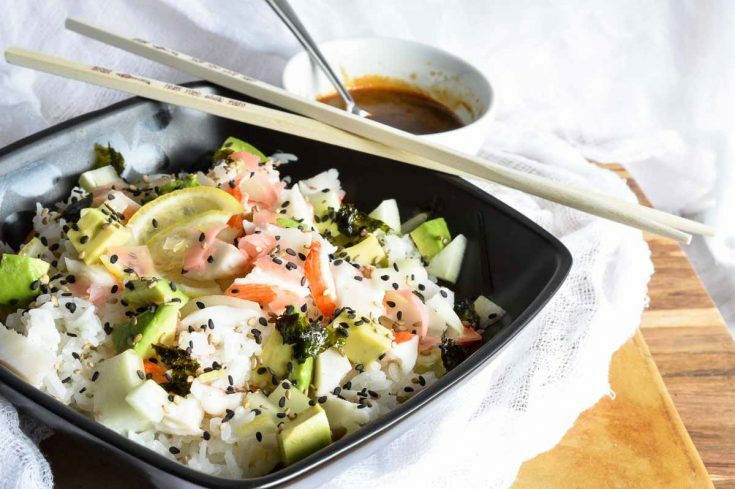 Super easy, healthy homemade sushi to the rescue with this California Roll Sushi Bowl Recipe! This tasty recipe is thanks to my brand ambassadorship with Rodelle. 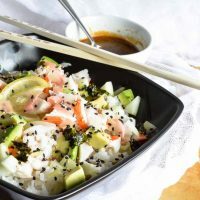 A couple months ago I could not get enough of these California Roll Sushi Bowls! Do you ever just get obsessed with a recipe and end up eating it daily for weeks? Yeah, that is what I did. 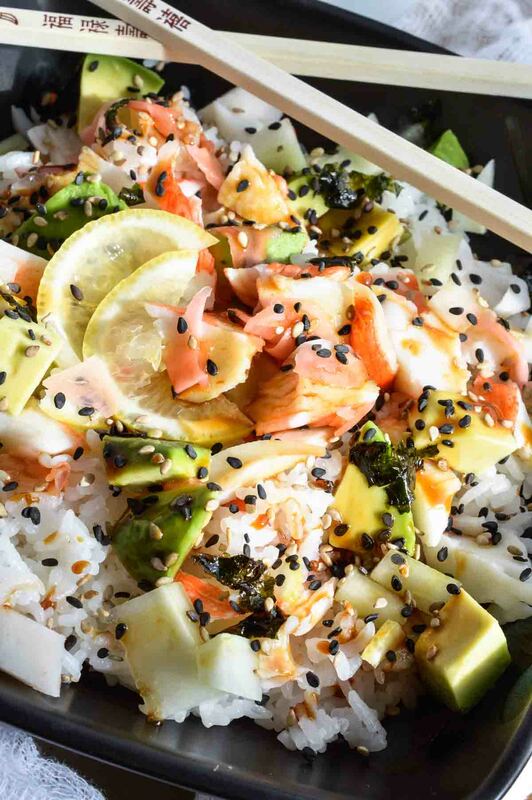 California Roll Sushi Bowls day in and day out until I couldn’t even look at a sushi bowl. But, it has been a couple months and this is looking pretty tasty to me again. I may have to go on my sushi bowl binge again! 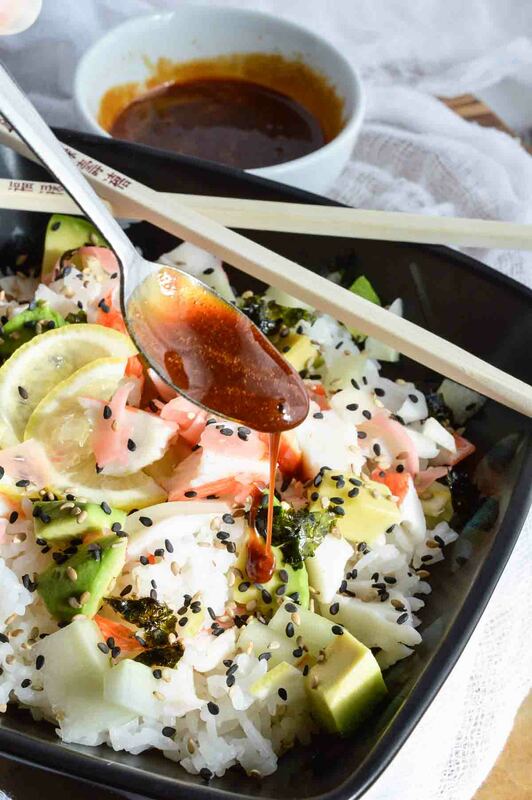 These sushi bowls are not complete unless you have black sesame seeds. They add that mild, nutty flavor. 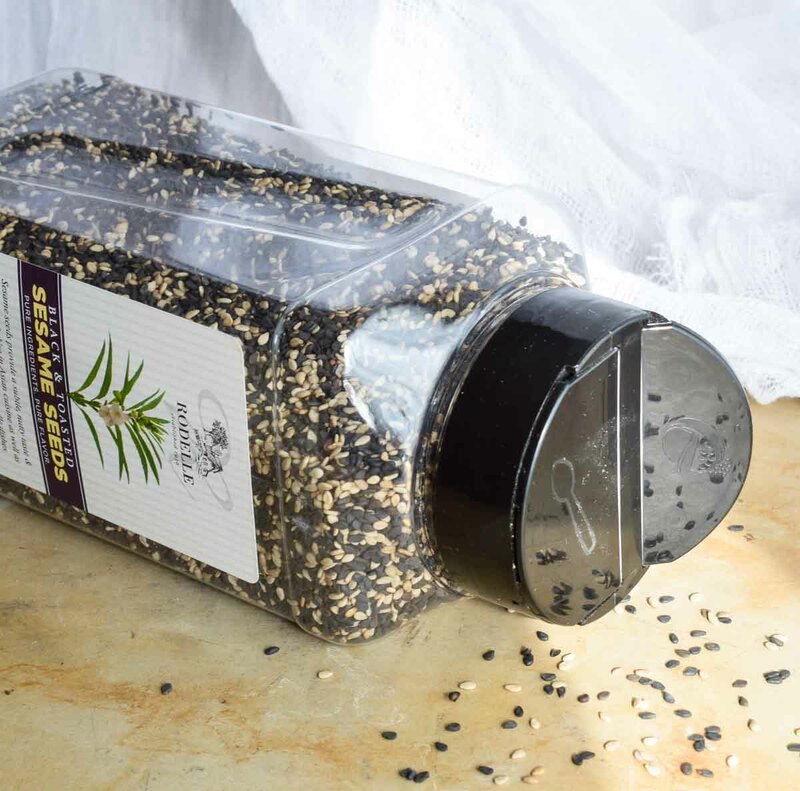 For some strange reason I cannot find black sesame seeds anywhere in my area. Luckily one of the perks of being a Rodelle brand ambassador is getting to try out their awesome products. While Rodelle is know for their high quality vanilla, they also have spices, baking essentials and many other ingredients. Check out their Black and Toasted Sesame Seeds and get started on your own California Roll Sushi Bowls! I made a super concentrated, sticky soy sauce drizzle. I love how it coats the dish and brings a sweetness. But, the ingredient that takes this dish from good to amazing is simple . . . LEMON! Last year I went to a sushi restaurant in Sacramento and many of their sushi rolls had lemon peels in them. I was skeptical but after that first bite I was convinced. Fresh lemon makes this meal bright and refreshing. Combine sauce ingredients in a small pot over medium heat. While continuously whisking, bring to a boil and reduce to a slightly syrupy consistency. This will take approximately 3 minutes. Do not walk away as this can easily burn. Remove from heat and allow to cool while assembling sushi bowls. Combine all ingredients and top with a drizzle of soy sauce mixture. *I use the microwaveable par-cooked rice packets to make this super convenient. Can I ask how many servings this makes? Hoping it can serve 4 as a side dish! Thanks! Yes, this should be enough to serve 4 as a side dish. Enjoy! I think it was Blue Nami in Roseville. I am now obsessed with lemon on my sushi rolls! I love this! I made it for my boyfriend and I last night to take to lunch today and using one pouch of 90 second rice, one small cucumber, and one avocado equaled out to be perfect to serve two. My only issue is that my rice got really hard from being in the fridge. Any tips to prevent this or a special brand you use? Thanks! Hi Alex. Yes, the rice can get a little stiff when refrigerated. I usually allow my rice to sit out at room temp before assembling my sushi bowl. Perhaps packing the rice separate from the other ingredients so that your boyfriend can take it out before mixing with the other ingredients. Hi Valerie! This should easily serve 2. If I double it, would it hold up pre-assembled in the fridge? I like to make my lunches for the whole week! Thank you for an brilliant twist on a favorite food!!! Can you clarify that “2 Cups Cooked White Rice* – cooled” means that you want two cups of cooked white rice (from 2/3C of dry rice) and not 2 cups of white rice, cooked (making about 6 cups of rice)? I have to thank you for this idea. I am 36 weeks pregnant and all I want is cake and Asian-inspired food. I have a hard time eating veggies and this thing gets a bunch of wonderful green things in me without me gagging. For the cost of ingredients to make this for lunches for the week was less than two California rolls from the place down the street. This is the only thing I want to eat now for lunch! Hi! 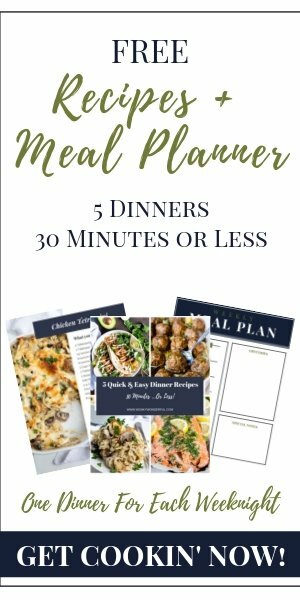 I have been on a health kick and have been pinning some yummy recipes! My mom made this for me today and i’m eating it as we speak! it’s is delicious! the only thing i would change is the lemon rinds included in the bowl, personally i don’t like the bitter taste and it was a bit overpowering for me but other then that i really enjoyed it! I love this recipe and have made it many times since I found it! I use coconut aminos and coconut sugar for the sauce, GF, less sodium and absolutely delicious!